This delicious item is available in all McDonald’s outlets nationwide from now until Aug 22, 2012 (only three months T.T). So what makes this menu item a particular favourite of mine? 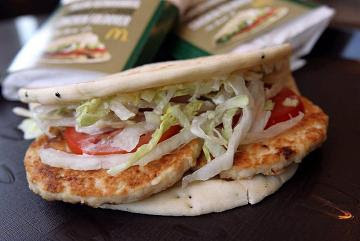 It has a balance of fresh healthy ingredients like lettuce, tomatoes, onions and two grilled chicken patties (grilled, mind you..not deep fried). To add tho it, it is dressed with garlic sauce (heaven) and wrapped in a toasted pita bread peppered with kalonji seeds. According to the Star, it has a unique packaging style, so busy people (like me) can consume it on-the-go without worrying much about it spilling on themselves. The Chicken Foldover is priced at RM8.60 for the a la carte menu, RM9.95 for the medium McValue Lunch and McValue Dinner sets (they have McValue Lunch and Dinner sets too!! ), while for the medium McValue Meal set is priced at RM12.25. wah!! i am definitely gonna eat !! 3months oni~!